Most every homeowner dreams of the perfect gathering place for friends & family, a massive kitchen island. This Yorba Linda homeowner turned her “destination island” dreams into a reality with the help of Sea Pointe Construction. This once tiny kitchen, barricaded off by a peninsula, is now larger than life! 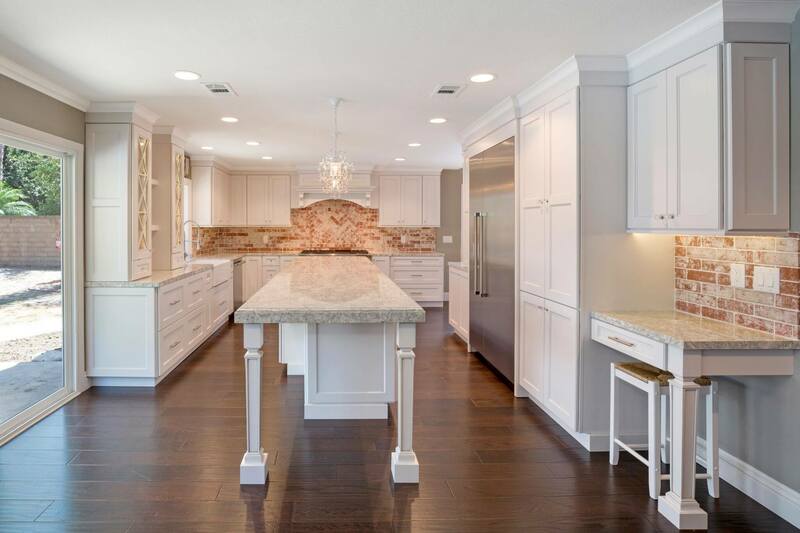 Though structural adjustments and a reworked floor plan, this newly remodeled Yorba Linda kitchen is truly the heart of the home. The unique brick detail has a farmhouse feel while white Renner cabinets and quarts counter tops bring a chic design style. At a whopping 13 feet long; this kitchen island is not only a gathering place for family and guests, but also provides custom pullouts, inserts and a microwave drawer. Strategically placed glass upper cabinets are the perfect place to display stylish flatware. This dream kitchen absolutely breaks the white kitchen mold while supplying our client with unsurpassed space and functionality.